A group of lovely ladies from across Renfrewshire Council have come out in force to show their support for the newly re-opened and beautifully restored Renfrew Town Hall by donning their bridal gowns one more time for a unique town centre bridal gathering. 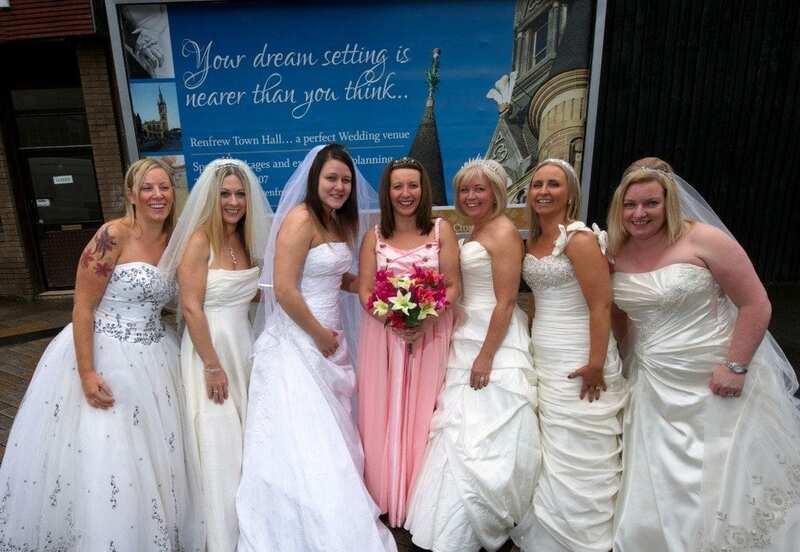 Renfrewshire brides and bridesmaids who have been married in the town recently to others who are celebrating longer anniversaries all jumped at the chance to wear that special dress again though this time with friends and colleagues in order to help raise awareness of Renfrew’s hidden gem fairytale castle style wedding venue. Sheonna Anderson, Valerie Kelly, Michelle Carslaw, Linsey Matthews, Bobbie O’Donnell , Mary Longwell and Tricia Gault all from various sectors across the Council braved the weather and stopped traffic in Renfrew town centre yesterday as they made their way up the High St in their beautiful gowns. Renfrew Town Hall has a rich and varied past dating back to 1670. It has served as a courthouse, an early 19th century jail, a focal point for community and civic activities and more recently of course a wedding venue. The venue was officially opened by deputy First Minister Nicola Sturgeon on 28 January 2012 after a £5.2million programme to fully refurbish and renovate all aspects of the building.